About Death Valley National Park, California. Fantastic composition and the hues are perfect.. I like these layers, the moon and the sky goes well with it.. I am really blown off by this shot. More then a painting.. it's like a dream..
What a wonderful art work full of passion, beauty all around, full of fantastic feelings and mood, excellent art-work indeed Debjit, in my Favorite!! 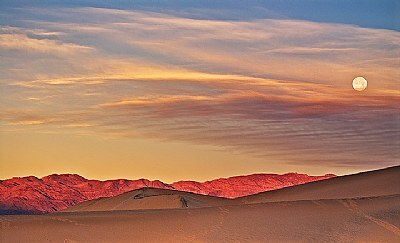 Wow, Debjit... excellent Death Valley shot!!!! WOW, unreal landscape, very nice capture. details achae tobe hoito web version thik bojha jachhe nah...eta telezoom e neowa..
Oh! You had many new and interesting pictures! With pleasure has looked. khub sundor. samner bali tay payer chhap gulo aar ektu prominent dekhano jeto ki kono bhabe? WOOOOW...AMAZING colors,details and a VERY good composition!!!PERFECT! Did I say good, maybe an understatement. Great colors and composition. Wonderful POV and background. Your work is very inspiring. Thanks for spreading it around! Awesome image with stunningly beautiful colors.